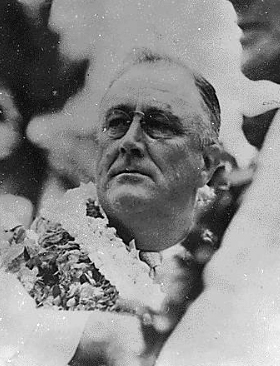 FDR, adorned with flower leis. The Hawaiian Islands, located at the northernmost part of Polynesia, were annexed by the United States in 1898, and in 1959 became the nation’s 50th state. By the time of Roosevelt’s presidency Hawaii was characterized by an incredible diversity of cultural ancestry, including Native Hawaiian, pan-Asian and North American. To this day, the state remains one of the most ethnically diverse places in the world. 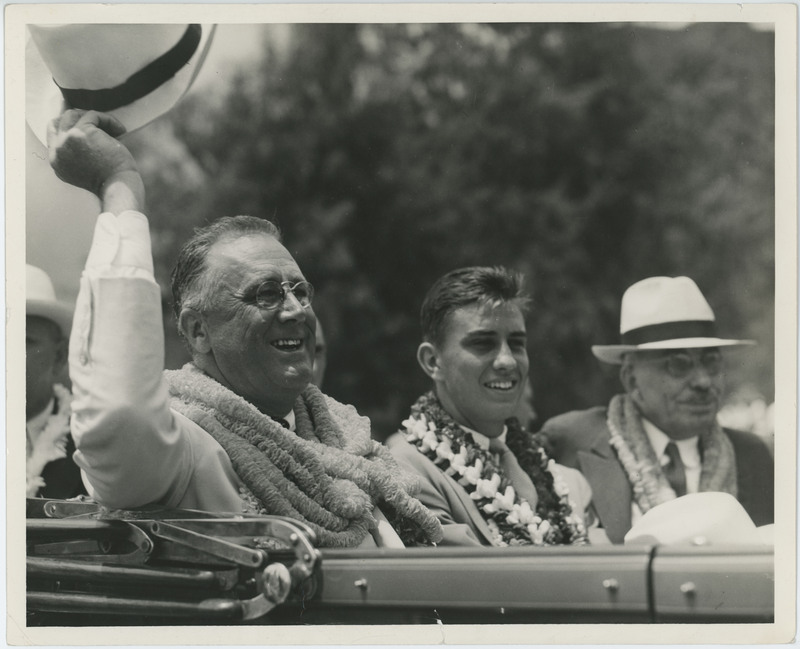 In July of 1934 FDR became the first sitting U.S. president to visit the Territory of Hawaii. He traversed the Pacific aboard the USS Houston, debarked at both the ports of Hilo and Honolulu, and stayed on the Islands for several days to tour both cultural landmarks and military areas. The people of Hawaii made every attempt to welcome the President and share with him the best of Hawaiian culture, both ancient and modern. 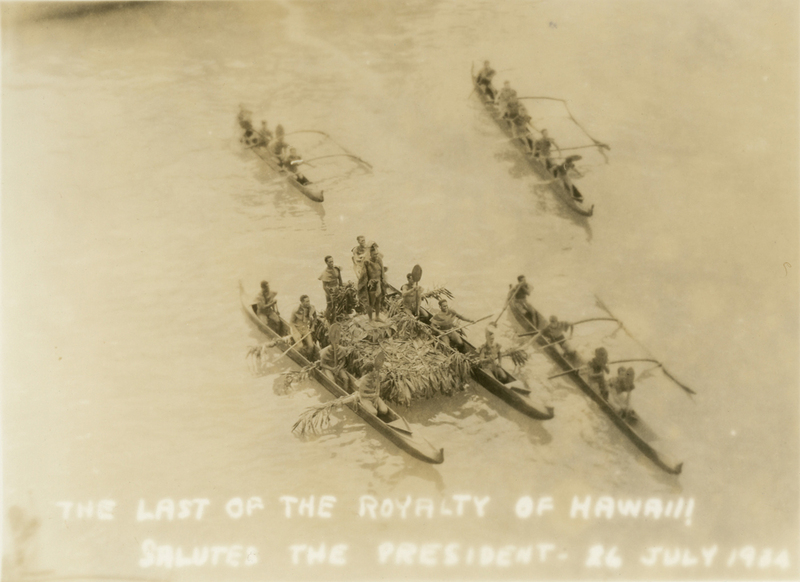 When FDR arrived at Honolulu he was greeted by an estimated 60,000 people, including a flotilla of traditional Hawaiian outrigger canoes. He was adorned with customary flower leis, was an honored guest at a traditional luau feast complete with a kalua pig cooked in a traditional imu (underground oven), and the legendary surfer, Duke Kahanamoku, gave lessons to FDR’s sons. Roosevelt’s Hawaiian hosts also showed him the most modern of their New Deal inspired building developments and educational facilities. 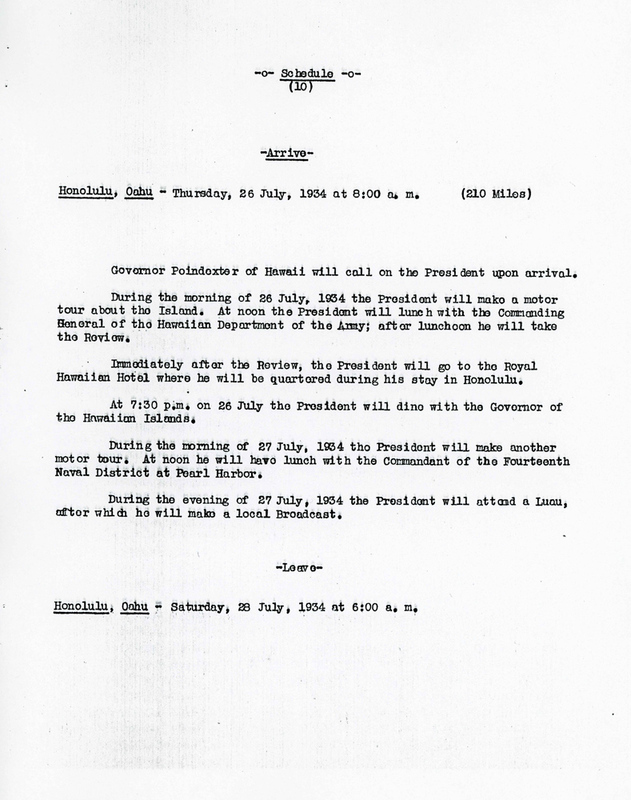 FDR’s itinerary for July 26, 1934 included military inspections and a Hawaiian luau. In his departing remarks to the people of Hawaii on July 28th, the President thanked them and wished to all, “Aloha from the bottom of my heart.” FDR’s next and final visit to Hawaii would take place ten years later, in 1944, near the end of World War II. By that time the small yet influential Pacific Island chain had taken on a more infamous role in world history. The National Archives has shared a new “set” on the Flickr photosharing website that contains photos and documents relating to Asian Pacific American Heritage Month. See the images. The recent October nor-easter snowstorm made us all think about warmer and sunnier places. And once again, the serendipity of archives provided us with a vicarious escape from the piles of snow. In July 1934, FDR took a lengthy fishing and inspection cruise aboard the USS Houston, traveling to Haiti, Puerto Rico, the Virgin Islands, through the Panama Canal to the Cocos Islands, and on to the Territory of Hawaii, where he toured the islands from July 24-28th before proceeding back to the US mainland. 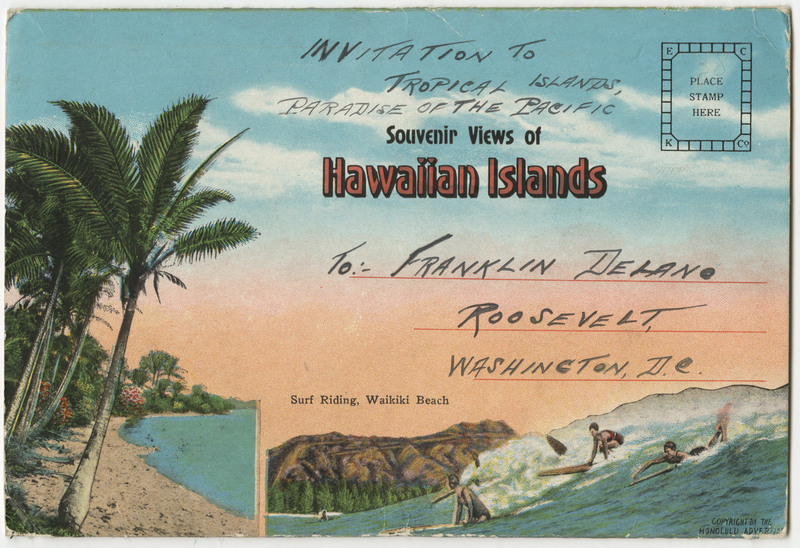 While researching a question about FDR’s travel schedule, one of our archivists came across a wonderful booklet of period postcards from Hawaii that were sent by an admirer to the President in May 1934 in anticipation of his visit. We plan on looking at these often during the coming winter!